It’s no secret that people who are homeless tend to have more health problems than people who have homes. What might surprise you is that people who are chronically homeless have a life expectancy 25 years less than the general population. Why? The reasons are many and tragic. Without a home, people often end up sleeping on the streets where they’re exposed high levels of stress, physical and sexual violence, and other environmental factors that take a toll on health. And while shelters provide protection from the weather, crowded conditions can lead to violence and are often only offer temporary relief. Homelessness takes an especially hard toll on people with chronic conditions such as diabetes, mental illness, or asthma. Managing these conditions when homeless is incredibly difficult. Making and keeping doctors’ appointments is hard if you have no phone, or if your ID was lost during a street sweep. You have nowhere to rest, no safe and secure place to store your medication. The challenges are many and often insurmountable. Below is a list of the most common chronic health problems I see in my patients who are homeless. I provide this list to help illustrate how health and housing are intimately connected. All of the conditions listed are difficult to treat when a patient has a home. When a patient doesn’t have a home, effective treatment is nearly impossible. While any mental disorder is isolating, schizophrenia is especially so. Symptoms can vary from person to person. One person might have auditory or visual hallucinations. Another person might believe that everyone is out to ‘get’ them. And yet another person might have a combination of many symptoms. Schizophrenia symptoms can be frightening for the person experiencing the symptoms and for people in the vicinity who don’t understand what’s going on. People who have schizophrenia and who are homeless are especially disadvantaged because they struggle to find housing or treatment by themselves, and may not have friends or family to help them. Sometimes, the persecutory delusions my patients suffer with are not far from the reality they experience. Also, their behavior can be misunderstood by many as threatening, which can lead to arrest, resulting in a whole other bucket of problems. People with schizophrenia need a roof over their head and supportive services if they are going to be able to manage their illness. If connected with housing and the treatment they need, they can go on to lead stable lives. Unfortunately, many people with schizophrenia who are homeless are caught in a revolving door, cycling through jails, hospitals, and shelters, only to end up on the street, ill as ever. A lot of people I see who are homeless have mixed substance abuse disorder, which means that they are addicted to more than one substance, usually alcohol, stimulants, and/or opioids such as painkillers or heroin. In our society, there is an incredible stigma around addiction. We often look at addiction as a personal failing. Suspending judgement and caring for people suffering from substance abuse the way we attend to people with other chronic conditions can provide a solid foundation for effective treatment. Sometimes addiction can lead to homelessness. Sometimes people become homeless, then turn to substances as a sort of escape and relief from the stress and trauma that come from being homeless. It’s a vicious cycle, and one that we need to interrupt. How? Again, through housing and supportive services. It’s unrealistic to expect someone with a substance use disorder to make progress if they don’t have a roof over their head. If they have housing, they are much more likely to recover. Metabolic syndrome is a group of risk factors: a large waistline, a high triglyceride level, a low HDL cholesterol level, high blood pressure, and high fasting blood sugar. If you have three of the five metabolic risk factors, you have metabolic syndrome and are at higher risk of heart disease, diabetes, stroke, and death. Millions of Americans (some estimate a third) have metabolic syndrome. Many do not know they have it, and those who do know often struggle to treat it. Treatment sometimes involves medications, but more often is limited to careful and thoughtful changes to diet and physical activity. Improving diet and exercise, the cornerstones of treatment for metabolic syndrome, is quite difficult without a stable place to live and cook. Also known as cardiovascular disease, heart disease is the leading cause of death for housed and unhoused American men and women. Heart disease is an umbrella term that refers to a range of conditions that affect the heart, including high blood pressure (hypertension), congestive heart failure, and coronary artery disease. Left untreated, heart disease can lead to heart attack, stroke, or death. Like metabolic syndrome, heart disease treatment involves changes to diet and physical activity levels. Sometimes heart disease treatment involves medications, and in certain situations a patient will need surgery. Implementing changes to diet and physical activity, adhering to a medication regimen, and recovering from surgery are all incredibly difficult tasks if you have no home. COPD is a disease that makes it hard to breathe. It is progressive, which means it gets worse over time. Cigarette smoking is the leading cause of COPD, and one of every two cigarettes smoked in the U.S. is by people with severe and persistent mental illness. COPD refers to two conditions: emphysema or chronic bronchitis. While there is no cure for COPD, stopping smoking can help relieve symptoms, slow the progress of the disease, and improve overall health. Treatment includes making lifestyle changes, and can involve medicine, pulmonary rehabilitation, oxygen therapy, and, most importantly, effective treatment for nicotine addiction to help someone quit smoking. There are many kinds of liver disease, but the kinds I see most often are caused by infection with hepatitis C or alcoholism. Hepatitis C is an infection that causes inflammation of the liver, and can spread through contact with infected blood. Hepatitis C is usually associated with injection drug use. Alcoholic liver disease occurs after years of heavy drinking. Both conditions can lead to scarring of the liver (cirrhosis). Treatment for hepatitis C involves taking medication. Treatment for alcoholic liver disease requires that the patient avoid alcohol. Recently, we have had considerable success achieving cures for hepatitis C for homeless adults who have been housed prior to treatment. Unfortunately, many people with advanced liver disease can only be treated with liver transplant which is not available or feasible if someone is not in stable housing. Thanks to advances in medicine, HIV is no longer the death sentence it used to be, if diagnosed early and properly treated. But in order for treatment to be effective, patients need homes. Studies that have looked at the association between homelessness and AIDS have shown that treating people with HIV while they are homeless has not improved life expectancy. In contrast, studies have found that formerly homeless adults who find permanent supportive housing have the same life expectancy as other populations of people living with HIV. All of the health problems listed above are difficult to treat even if a person has a permanent home. 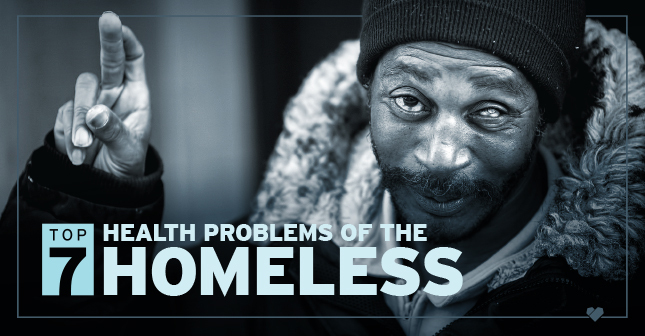 But for people experiencing homelessness, these health problems often progress rapidly and can lead to early death. Many people often point to cost-saving studies as a reason to house the homeless and provide them with medical care. They argue that by not providing housing to the homeless, we waste millions of dollars in emergency room visits, shelter operations, incarcerations, police intervention, and more. And they’re right. We, as a society, pay a lot of money to “deal” with people who are homeless. But as I said in an interview last year, no cost-saving study is going to change anything if we, as a society, believe that people experiencing homelessness are not worth saving. All life is of value and every person deserves the basic dignity of having a place to live. This belief is at the core of my work and is one of the reasons I work with Mercy Housing, an organization that provides permanent supportive housing to formerly homeless people. If we want to help the most underserved in our communities, we must start by providing homes. Joshua D. Bamberger, MD, MPH, is an associate clinical professor for Family and Community Medicine at the University of California, San Francisco, and is Chief Medical Consultant for Mercy Housing.